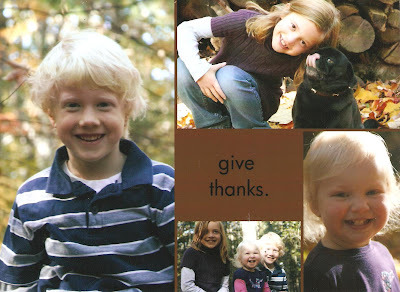 Happy Thanksgiving from the Holland-Anderson Family! One of my biggest challenges of teaching using reading and writing workshops is making sure that I confer with each student, check in with their reading response and writer's notebook, and give each student a chance to share each week. As I tend to be an out-of-sight, out-of-mind person, when I saw index cards tacked to a bulletin board under the heading "Writing Conference" in a colleague's classroom a few years ago, I knew it was something that I had to try. Over the past few years, our classroom workshop schedule has slowly evolved to what you see in the image below. In an ideal week (does that exist? ), a student will turn in his or her reading response notebook to me after independent reading, I'll read it that night and then have a chance to discuss their reading and their responses the following day when I confer with them. On the following day when they have an opportunity to share some of their thinking from their independent reading book, I can prompt them for any particular thinking that we had discussed the previous day or that they shared in their reading response notebook. The same process goes for writing. What systems or structures do you use in your reading and writing workshops? Or, borrowing words from Samantha Bennett in That Workshop Book, how do you help your "students [to] read, write, and talk about important content in order to learn how to read, write, talk, and develop their dispositions as thinkers?" Allow me to take you back eighteen years to the fall of 1991. My high school twelfth grade IB English class was reading The Grapes of Wrath. Groups of students were assigned the task of creating a product that would help the class further understand the time period in which the book takes place. 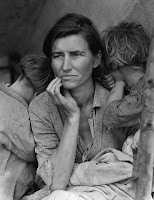 My group chose to create a photo essay using iconic, depression-era, black-and-white photos. To present the project in class, we played the video and, since we didn't have the capabilities to overdub the video with music, we played a CD of some melancholy bluegrass/folk music. I can still recall sitting in class watching the video, feeling proud of the product, proud of our accomplishment, and emotional as it sank in what life was really like during the depression. So, why the trip down memory lane? Yesterday morning, Alfie Kohn tweeted a link to a piece that he had written five years ago entitled, Feel-Bad Education: The Cult of Rigor and the Loss of Joy. As I was home sick in bed, I had the time to read it and found it entered into my thoughts throughout the day. Then, (and I love it when this happens) later in the day when I opened Google Reader I found a post by Dean Shareski with his reflections on the same article that he had seen on Twitter. Rather than share additional comments when I feel some great points have been made, I'd like to raise a few questions. When I completed the photo essay group project, I felt a great deal of satisfaction and a sense of accomplishment and yes, joy. Today, given the advances in technology, my fourth graders could create a more professional looking presentation with the same content in a fraction of the time. But would they feel the same sense of accomplishment? Can we ensure that our students will feel a sense of accomplishment--and joy--when they complete a project, with technology or without? Is it all about making the project authentic and relevant? Is that enough?